This quote, attributed to physicist Wolfgang Pauli in reaction to a student’s college-level paper, aptly applies to another attempt by Politico — the Washington, D.C.-based website known more for its political coverage than its expertise in scientific issues — to delve into complicated science-related agricultural issues. Last month, Politico posted an infographic that purported to offer a “deep dive” into gene editing. But as we outlined in our story, the information they offered was poorly sourced and inaccurately portrayed. Of major concern, Politico relied on fringe critics of mainstream biotechnology as their primary sources. Their initial infographic contained a number of accusations of GMO-based health problems by John Fagan, Claire Robinson and Michael Antoniou, all members of the Maharishi University-based religious organization, which espouses transcendental meditation, organic food and the strict dictates of the group’s founder, and is virulently anti-GMO. (Fagan’s official title is: Raja of the Global Country of World Peace with Global Responsibility for Food Purity and Safety and for Healthy Invincibility; he is charged with creating a global network of “Maharishi Invincibility Laboratories” (MILs) to use “scientific testing methods” to verify food purity and quality of Maharishi Vedic Organic products.) They collaborate on such sites as GM Watch and have formed an anti-biotechnology group known as the Earth Open Source project. Politico quoted a 2015 publication by these activists claiming that “chronic diseases in the United States have dramatically increased since the introduction of GMOs and certain pesticides,” in particular linking the rise in reported cases of autism to the use of glyphosate, the herbicide often paired with genetically engineered crops. In fact, researchers have found no link between GMOs and any health problem, and there is no evidence that links glyphosate to autism. Politico ignored GLP’s suggestion to consult with more mainstream critics of crop biotechnology, and when given the chance to address the actual science behind the issue of breeding, the editors declined. In the case of genetic engineering of seeds, there is an overwhelming scientific consensus that genetically modified crops and foods and the chemicals used with them are safe. More than 2,000 studies, published in peer-reviewed journals and presented at professional meetings, have not uncovered introductions of disease (chronic and otherwise) and have not shown any adverse effects on health linked to GMO crops or the pesticides used with them. Politico’s graphics editors Clark Patterson and Todd Lindeman, who have no background as working scientists or journalists writing about crop biotechnology, did not respond to questions from the Genetic Literacy Project about their choice of sources. Now Patterson and Lindeman are back again with another politicized infographic. 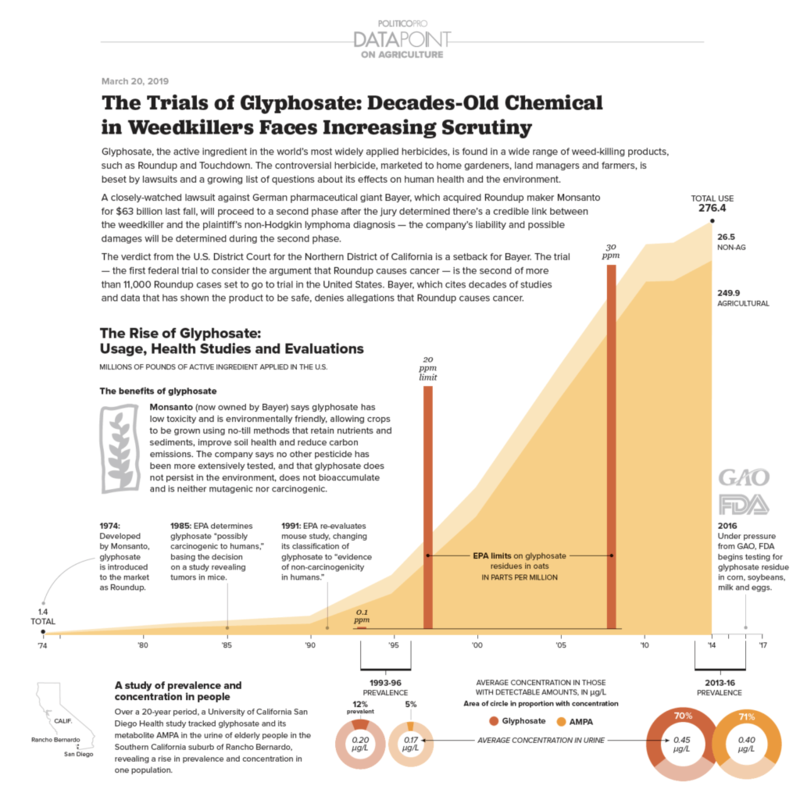 The latest infographic, like the first one available only through a $9,500 annual subscription to Politico’s Data Pro (see below; we obtained a copy from a source), appeared to delve into more literature, scientific and otherwise, that addressed concerns about glyphosate. It interweaves accurate regulatory decisions and one or two reputable studies on glyphosate with pseudo-scientific and non-regulatory issues such as high-profile lawsuits and complex regulatory disputes. But as in the first infographic, the decisions and the studies are cherry-picked, highlighting outliers rather than mainstream findings, apparently to fit the narrative being promoted by anti-GMO scientist Michael Antoniou and the Washington-based Environmental Working Group, which has been politicizing this issue for years. The graphic, like all of the campaigns targeting glyphosate, revolves almost entirely around the findings of one agency, the International Agency on Research on Cancer (IARC), an independent body housed within the World Health Organization that has evaluated the hazards (but not risks) of cancer of a nearly 1,000 substances and activities (IARC has determined that all but one of the substances or activities it has evaluated are hazardous, including sunbathing, going to the barbershop, drinking wine and sipping a cup of hot coffee in the morning). To introduce glyphosate’s relationship to cancer, Politico cites IARC’s 2015 report at face value. The Politico graphic introduced the IARC’s ‘hazard’ decision and paired it with one of the thousands of court cases against Bayer, which have relied heavily on the IARC decision to make their cases. IARC’s hazard evaluation has so far spurred two successful lawsuits against Monsanto (acquired by Bayer Crop Science in 2018)—in August 2018 and March 2019. In both cases, the jury determined that glyphosate was responsible for the plaintiff’s non-Hodgkin’s lymphoma (NHL), a rare type of cancer. Similar claims are expected to be presented in more than 600 additional glyphosate-related lawsuits. Click for a downloadable version of this graphic. 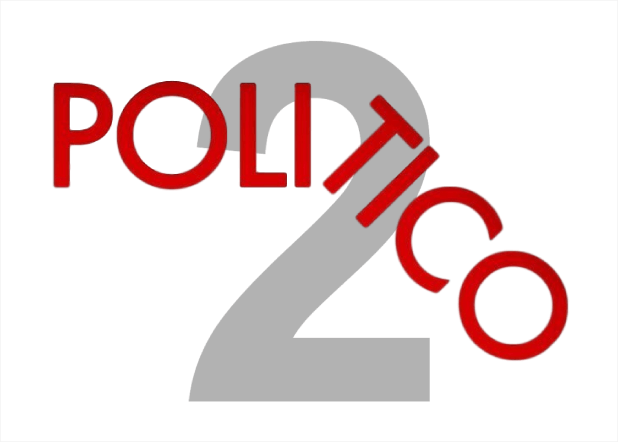 The Politico graphic focused much of its attention on prevalence and concentrations. It presented a number of studies that showed prevalence of glyphosate (or its metabolites) in urine, food, soil and wildlife habitats. A urine study conducted at UC San Diego showed an increase in concentrations but no health effects (though a university press release quoted one of the researchers as saying that health effects were possible, without any citations). The food studies were conducted by the EPA, which found glyphosate levels well below federal standards (which was cited correctly by Politico), and by the anti-GMO activist group Environmental Working Group, which claimed to find glyphosate in oat-based cereals and granola bars. In the EWG example, Politico didn’t point out that the levels found were extremely low. In toxicology, levels are more important than pure presence of a potential toxin. A soil study in the Journal of Agriculture and Food Chemistry and another in Pest Management Science were cited as showing glyphosate residues in soils, but as even Politico pointed out that the chemical breaks down relatively quickly, and it does not affect mineral content and crop diseases. The Pest Management study, Politico notes, showed minor soil chemistry effects that were largely offset by no-till practices made possible by using glyphosate and glyphosate-resistant crops. In the chart, Politico also mentions that “under pressure from the GAO,” the FDA began testing for glyphosate in eggs, soy, milk and corn. What Politico left out was the fact that the FDA studied a range of herbicides and other pesticides and found nothing that violated federal health limits or posed any health threats, and that some foods had no pesticide residues at all. Shorter pregnancies: Prominent space is given to a single study that also studied glyphosate in urine, this time in 71 pregnant women in Indiana. The study, which found a correlation of sorts between urine glyphosate concentrations (between 0.5 and 6 micrograms per liter, or parts per billion) and shortened gestational times, also didn’t find any health effects, a fact left out by the Politico graphic. 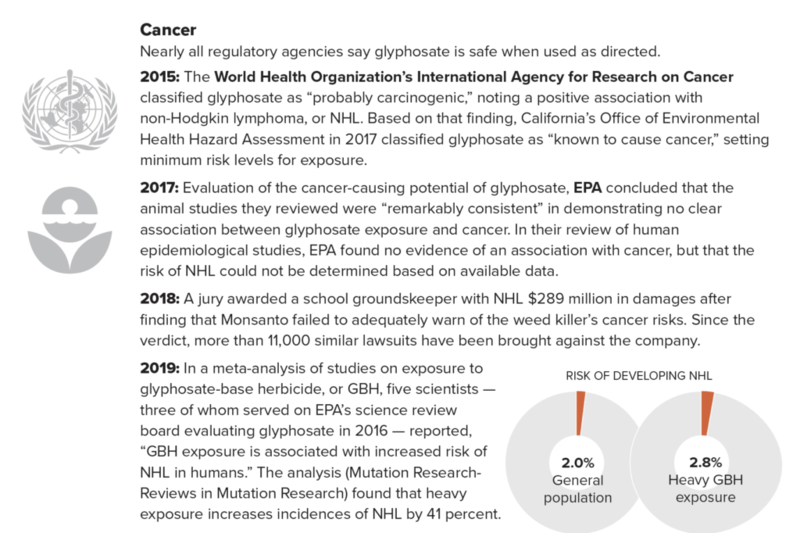 Cancer: Politico states that regulatory agencies worldwide have found through their own work and that of legitimate scientists that glyphosate has so far posed no health risks, as seen in the GLP infographic, which they did not post. It also notes an EPA review finding no association with cancer, but “the risk of NHL (non-Hodgkin’s lymphoma) could not be determined.” It ignores, however, the largest ever relevant study, the Agricultural Health Study of more than 44,000 pesticide applicators, which found no significant link between glyphosate exposure and elevate cancer incidence among those with greatest exposure. Politico also introduced a meta-analysis that showed that “heavy exposure of glyphosate increases incidences of NHL by 41 percent,” without mentioning that the meta-analysis of that figure had a sample size of exactly six and was culled from a larger study which did not support such a finding overall. That study was sharply criticizedcby mainstream scientists because of its flawed design. Related article: What's next in the long, heated battle over bees and neonicotinoid insecticides? Scientists say the challenge of herbicide tolerant weeds pre-dated the introduction of GMO varieties in 1996 and note that some of the most severe weed problems affect non-GMO crops, such as conventionally bred herbicide-tolerant sunflower plants. Weeds are inevitable in modern farming unless farmers rotate and mix their chemicals and include some non-herbicide defenses. In fact, glyphosate is remarkable for the length of time it took for any plant to show resistance, and some resistance, like in the palmer amaranth, was evident before glyphosate was even introduced, indicating a more general defense against certain chemicals. If GM crops have contributed significantly to the development of herbicide resistant weeds, we would expect the number of unique instances of these superweeds to increase following adoption of GM crops. … In the eleven-year period before GM crops were widely grown, approximately 13 new cases of herbicide resistance were documented annually. After GM crop adoption began in earnest, the number of new herbicide resistant weeds DECREASED to 11.4 cases per year. Mechanism: How does this glyphosate (or any toxin or pathogen) cause illness? Association studies are valuable for pointing to possible impacts on something or, but they can also exist simply by chance, or share a common cause. The real value of toxicology (which highlights why assessing risk is far more informative to regulators and the public versus assessing hazard) is finding a physiological, chemical or other means by which the harm is carried out. Without a mechanism, you can’t determine whether there is a real-world threat. Dose response: At what concentration in tissues does a chemical show some kind of physiological change? Findings of trace amounts of glyphosate in the parts per billion or trillion have generated headlines and been part of lawsuits, but are almost never a problem, unless a chemical is particularly biologically active, like nicotine or cyanide. Toxicologists take pains to produce what are known as LD50s, the dose at which a substance kills half of the host organisms. LD50 is a linchpin for the toxicology axiom, “the dose makes the poison.” The LD50 for glyphosate in rats is 5,600 mg/kg according to EPA figures, compared to 192 mg/kg for caffeine, 3,000 mg/kg for table salt, and 30 mg/kg for copper sulfate, a fungicide allowed on organic farms. Even IARC, in its hazard evaluation, acknowledges that glyphosate is barely toxic. It places it in the same hazard category as red meat, drinking hot beverages and going to the barber or hairdresser. The evidence for carcinogenicity for glyphosate was less robust than for eating bacon or salted fish or drinking scotch, wine or beer. The stuff of toxicology doesn’t make for a headline-grabbing “debate” that is the grist of political news. If bee microbiomes, urine concentrations and gestation times are to be taken seriously, they need to be run through the scientific toxicology process of determining mechanisms and dosage. Anything else is just politics, and that’s what Politico has indulged in in its two misleading infographics on glyphosate.